View Fall Festival’s Hay Bale Sculpture Contest Entries! 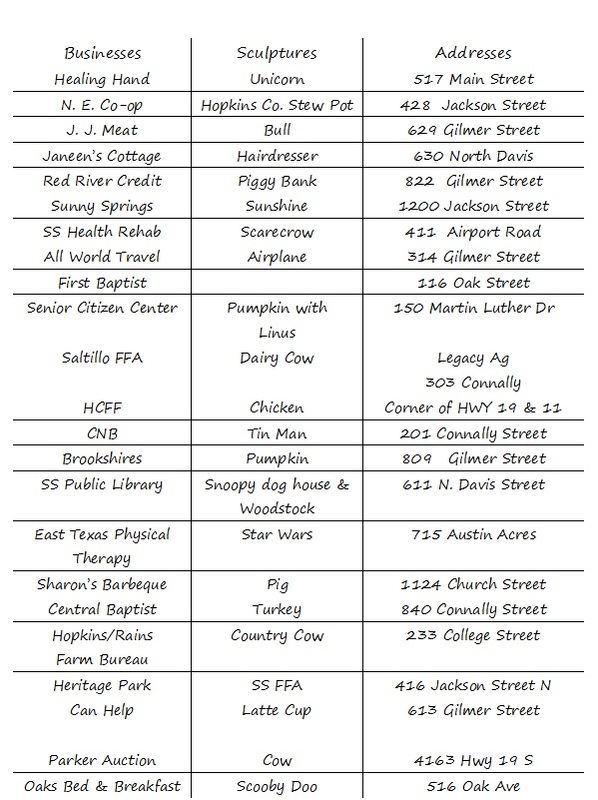 Home » Community News » View Fall Festival’s Hay Bale Sculpture Contest Entries! The first-ever Hay Bale Sculpture Contest is already a success, based on the number of entries! There are over two dozen sculptures entered in the new Fall Festival event. Awards will be $300 for Best of Show, $300 First Place, $150 Second Place, and $100 Third Place. Winners will be announced on Saturday Oct 27th at 2:00 p.m. at the pavilion in front of the Civic Center. We won’t know the top entries until judging is complete and winners determined, but you are welcome to view all the entries and pick your own favorites! With questions, contact committee member Shirley Patchen at 903-885-5914. Here is the list!